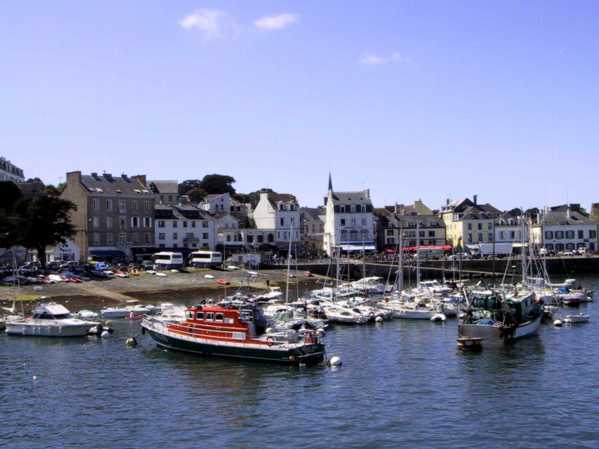 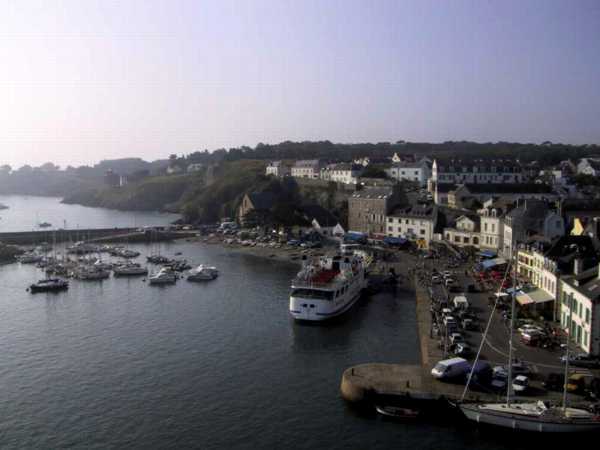 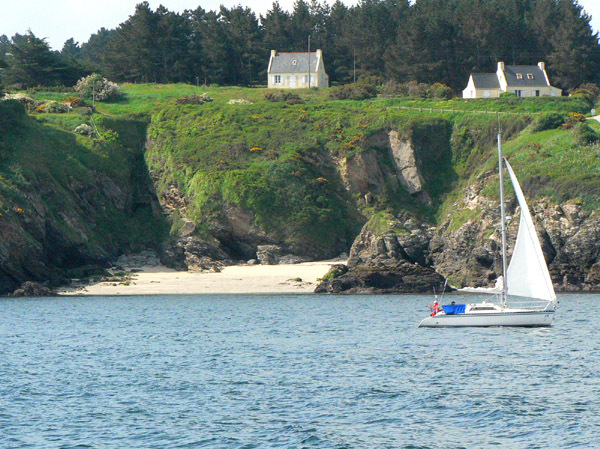 "Le Palais" (the residents of Belle-Ile say "Palais") is the main activity center of Belle-Ile (shops, public services, etc.). 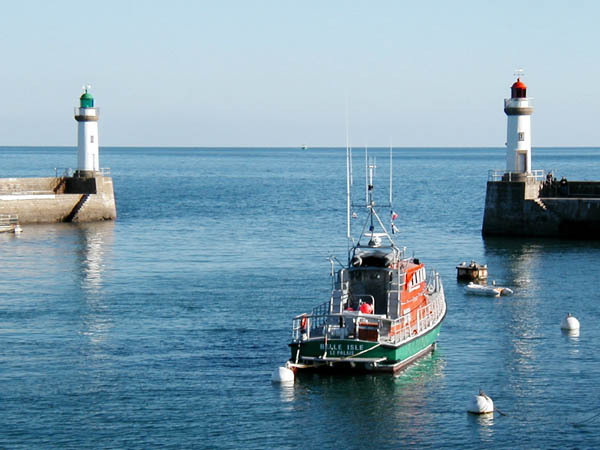 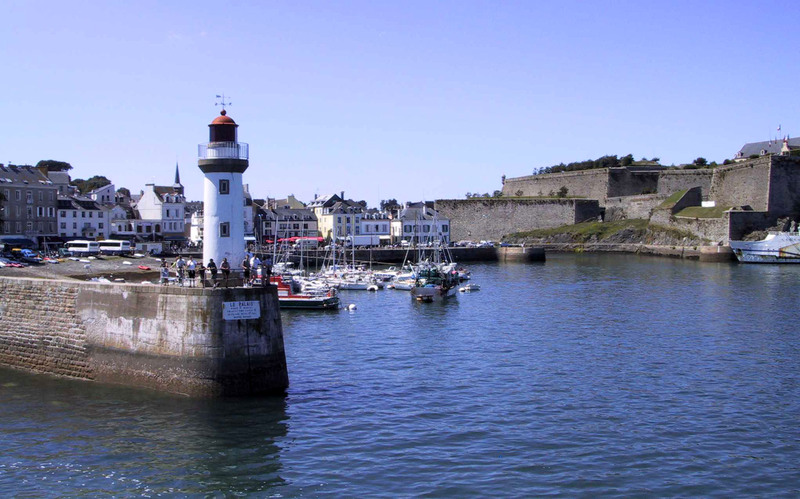 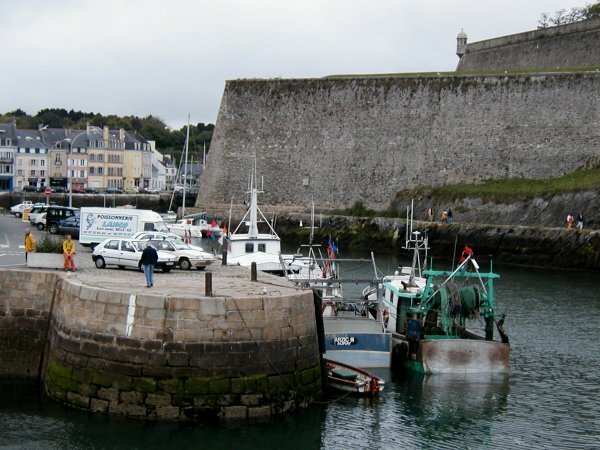 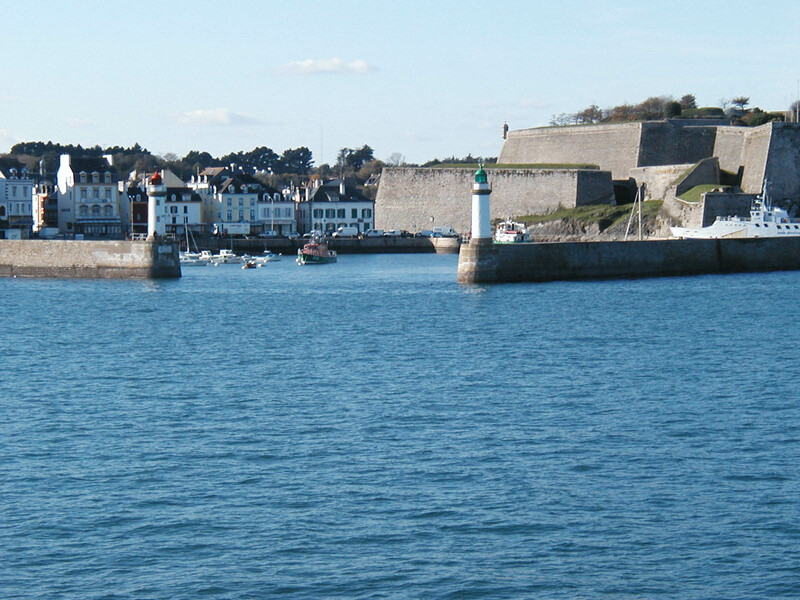 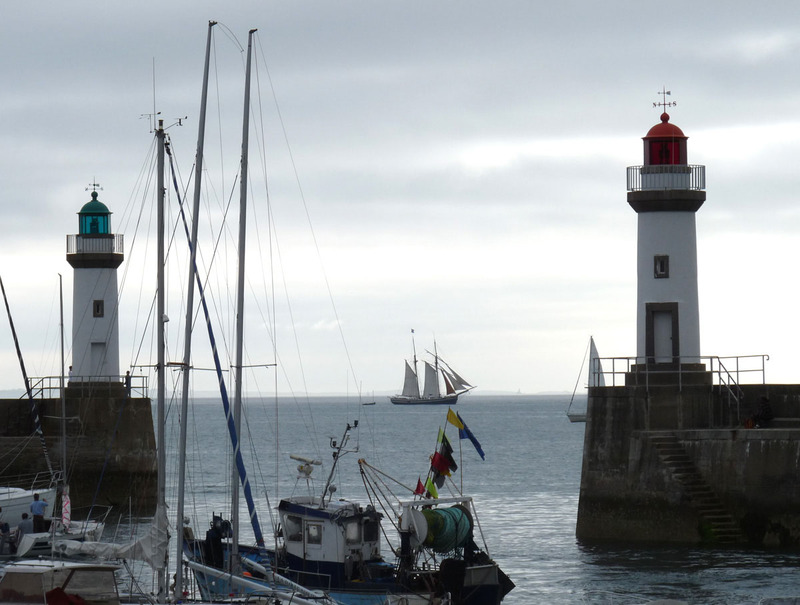 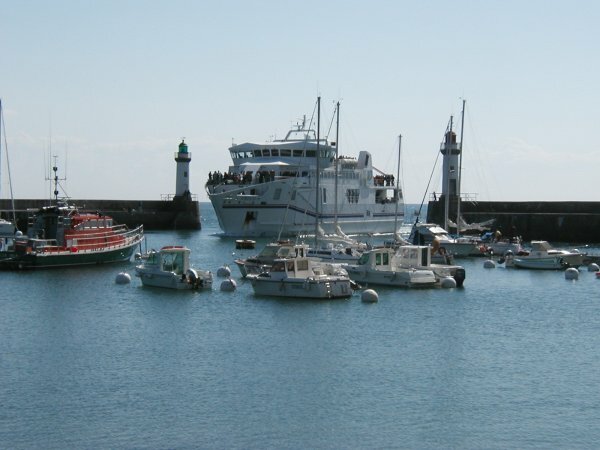 The Palais harbour is the entry port when you come from Quiberon with your car (there are some other summer links with Sauzon, but only for passengers without cars). 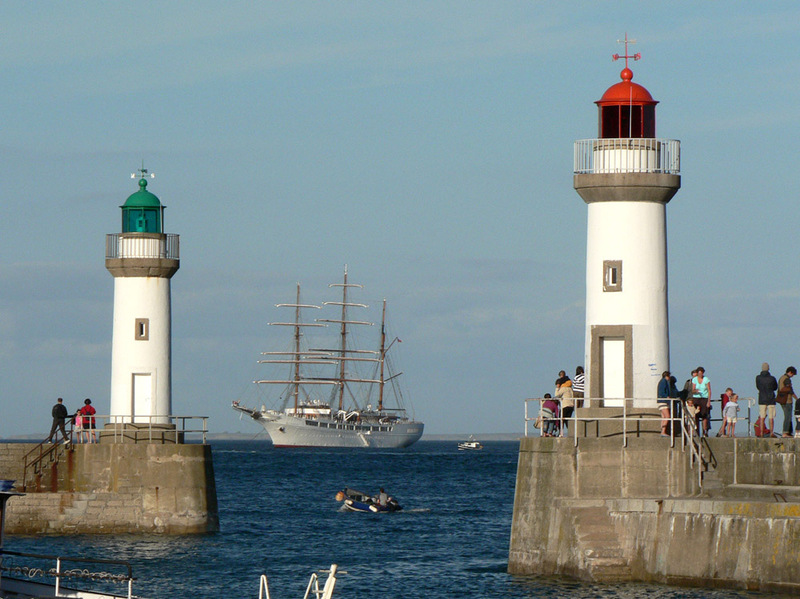 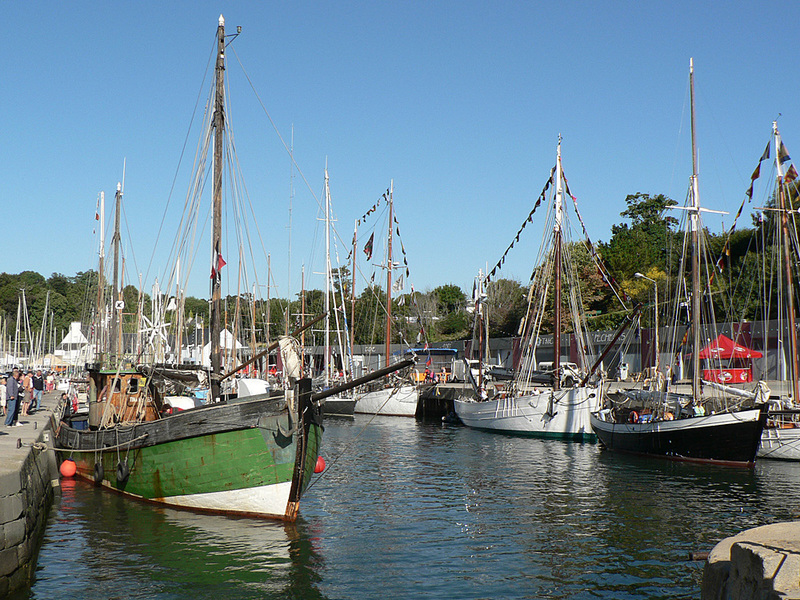 Palais is also a very popular harbour for pleasure boats in summertime. 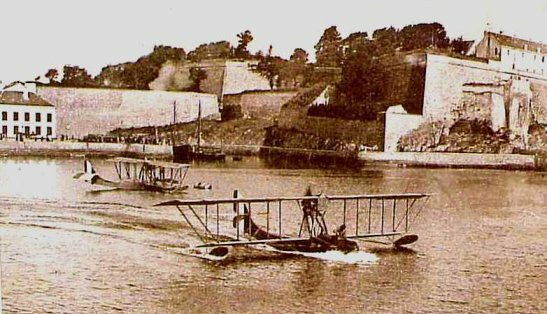 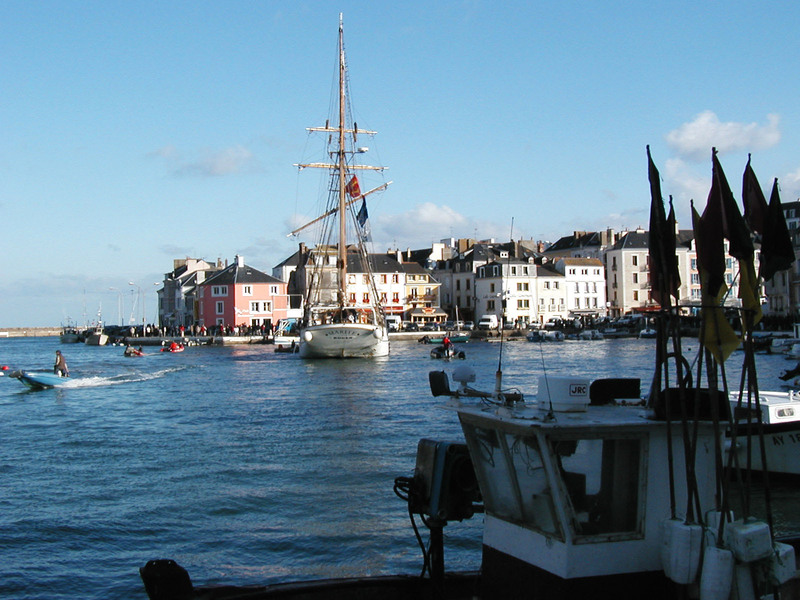 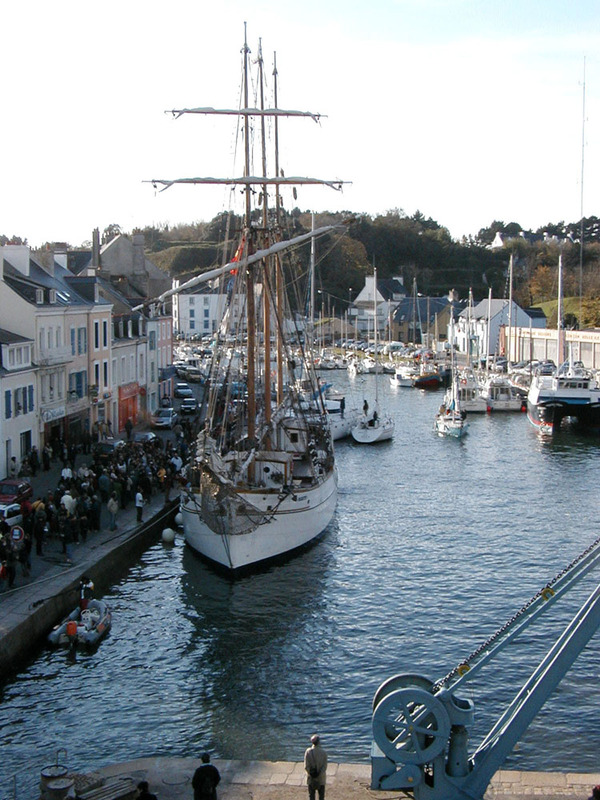 Every ship arrival is a source of activity for Palais and the streets around the harbour are very busy. 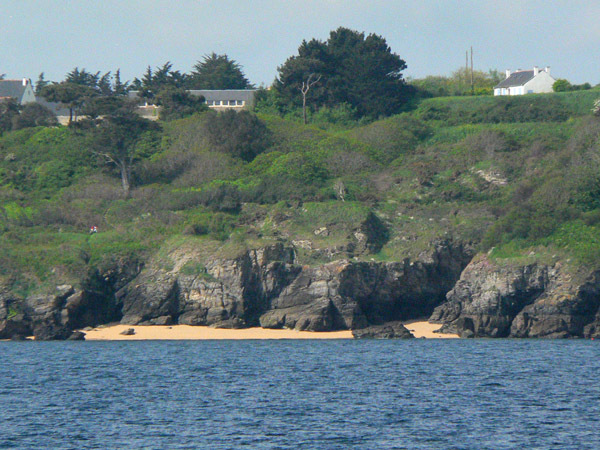 (Click on the small pictures to enlarge them. 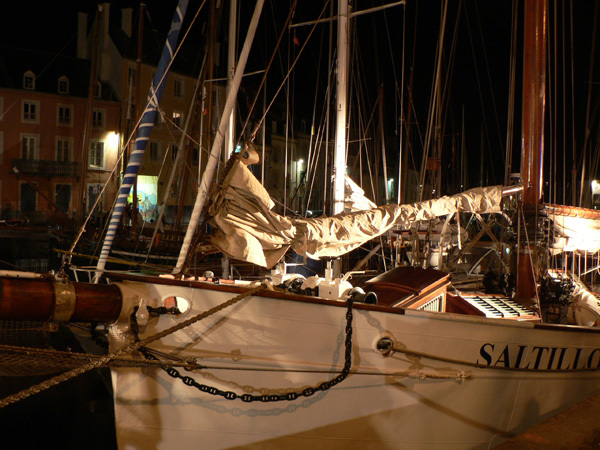 Some pictures are available in high definition (about 1600x1200 pixels): click on the link "(High definition)" to open them. 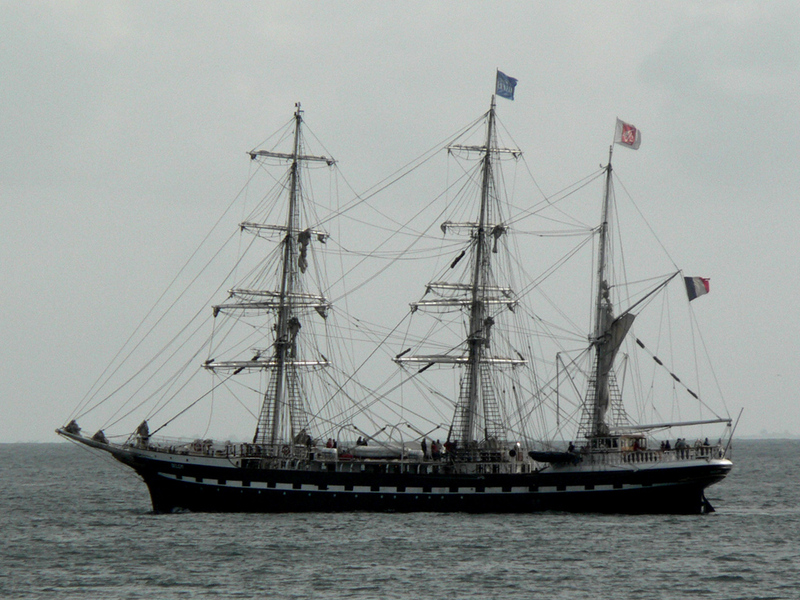 Arrival of the "Vindilis" shuttle ship at Palais. 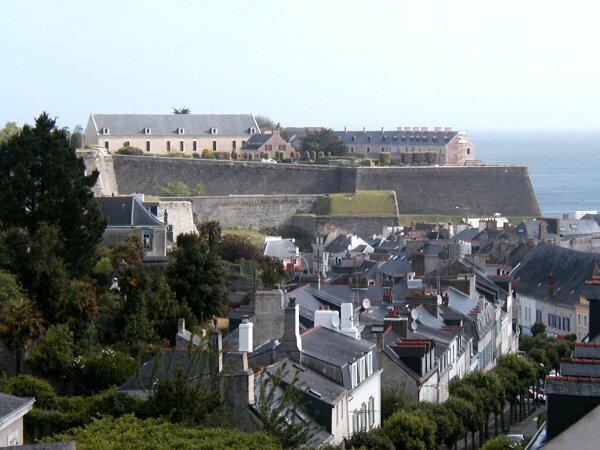 The Vauban citadel dominates the town. 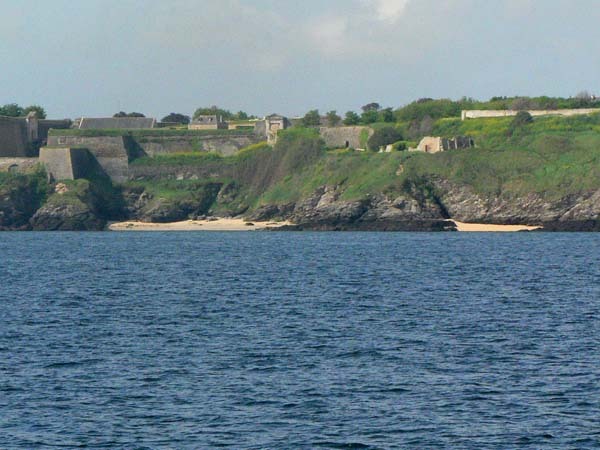 The beaching harbour, and the Leblanc quay. The beaching harbour at low tide. The cruise ship Sea Cloud II in front of the harbour. 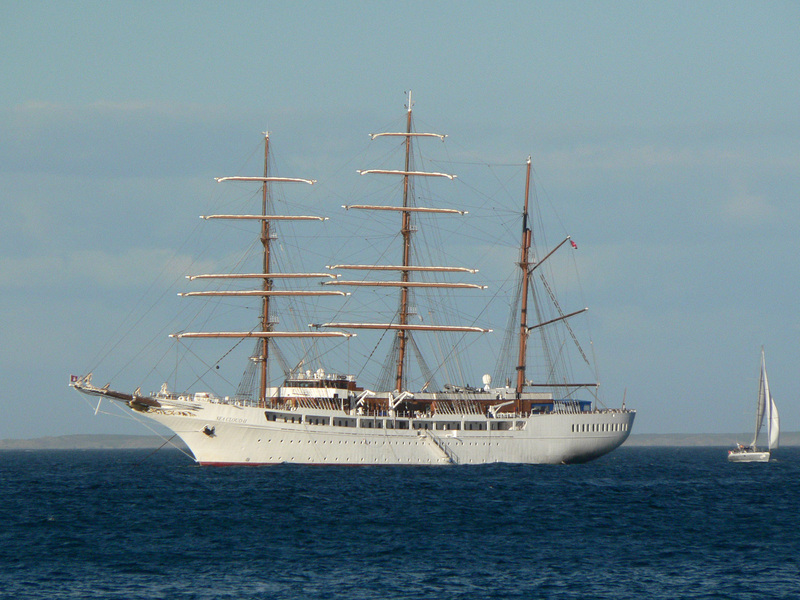 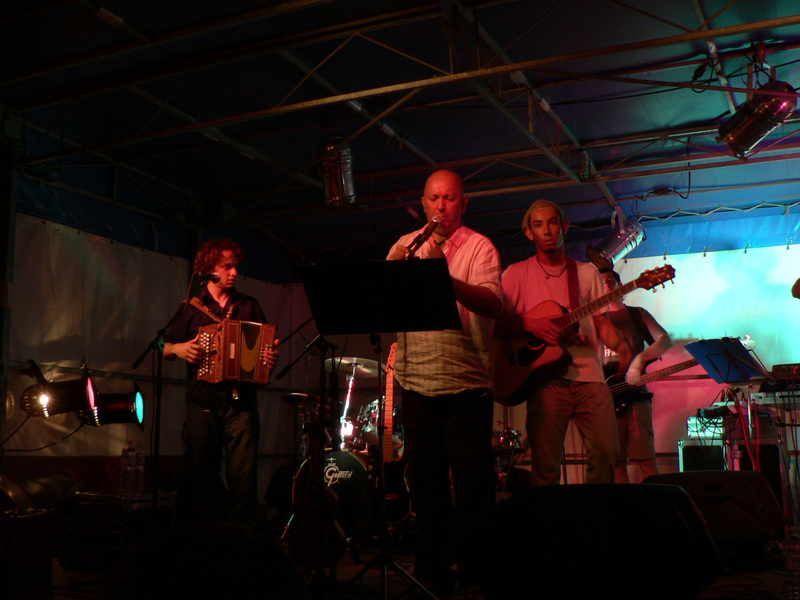 Call of the cruise ship Sea Cloud II. 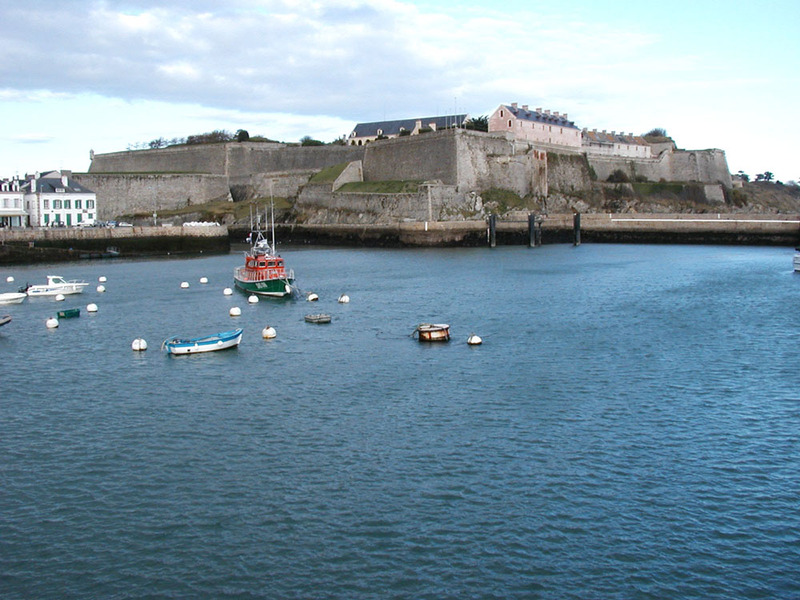 The harbour, seen from the " Bourdelle" pier. 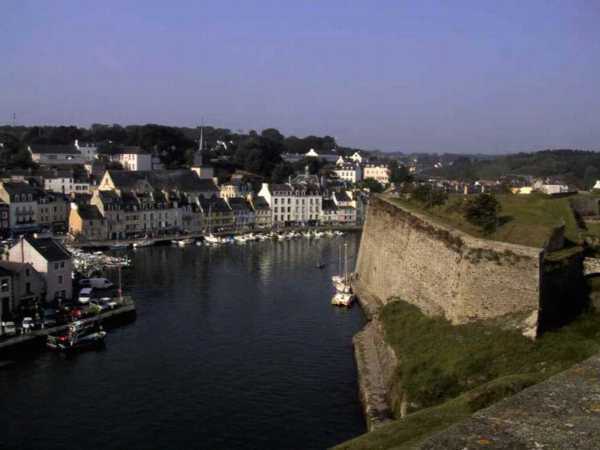 You can see, on the wall of the citadel, the white stone which shows the place where the Englishmen opened a gap in the wall of the stronghold in 1761. 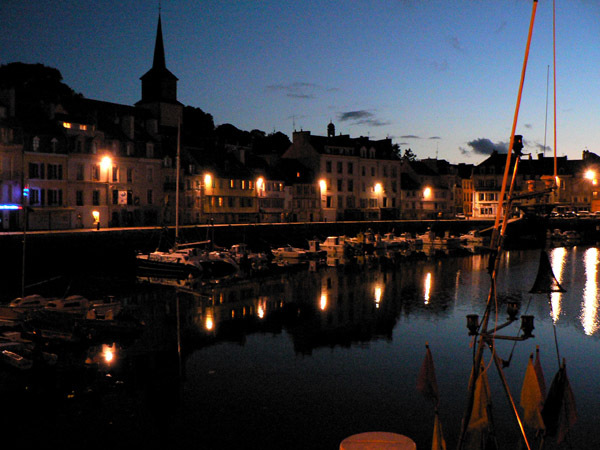 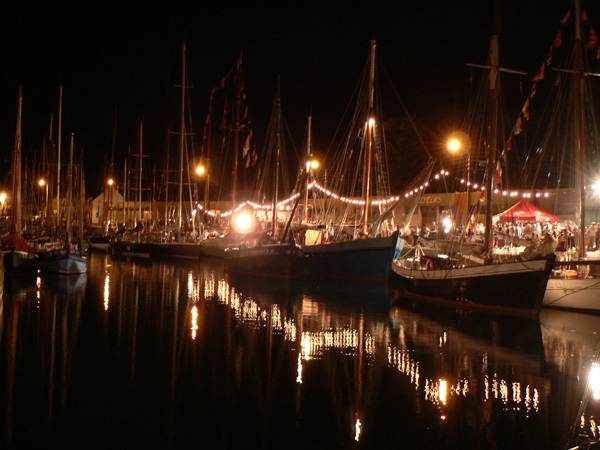 The beaching harbour in the evening. 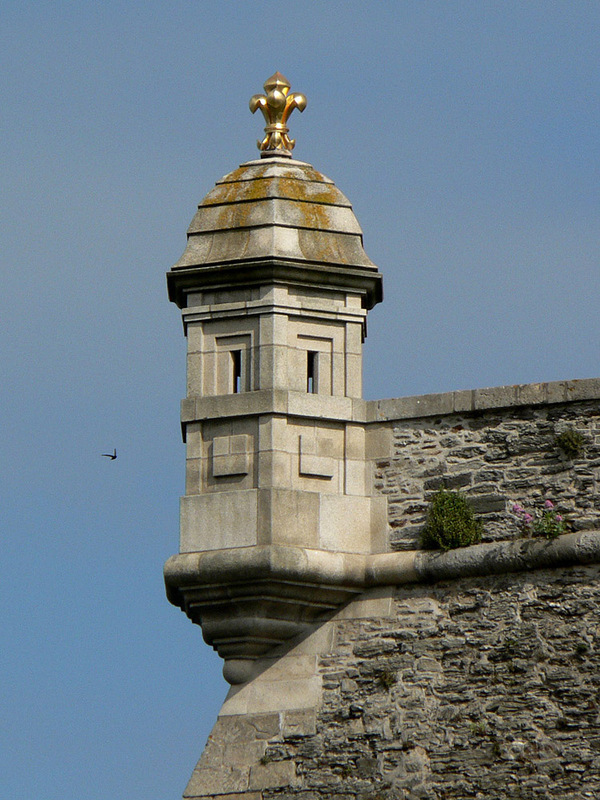 Other views from the ramparts of the citadel. 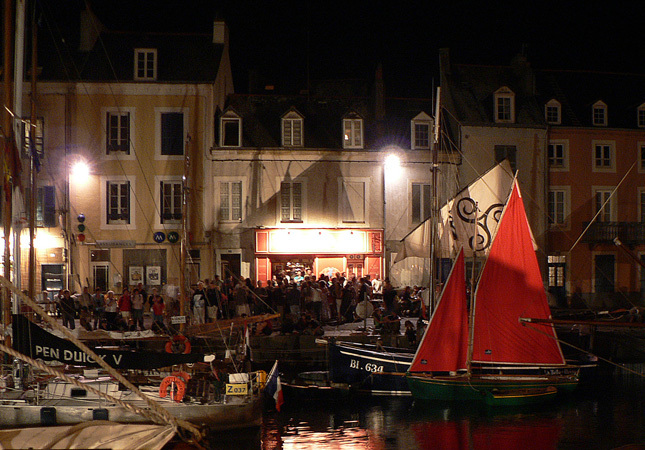 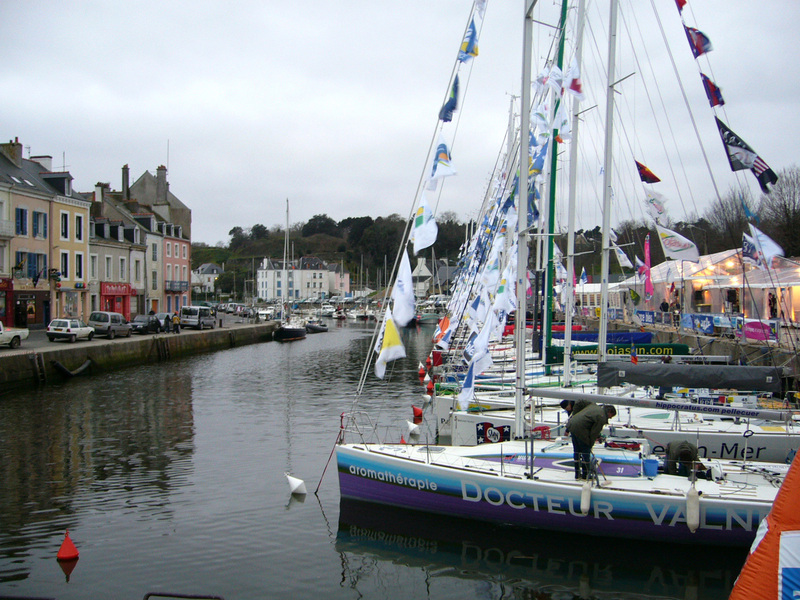 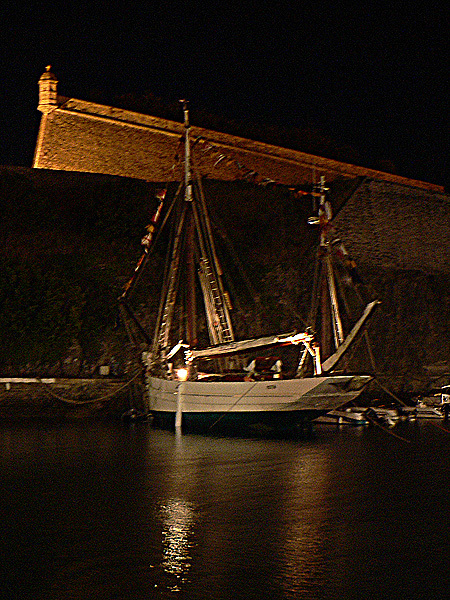 March 2007, preparation of the race Belle-Ile-en-Mer --- Marie-Galante. 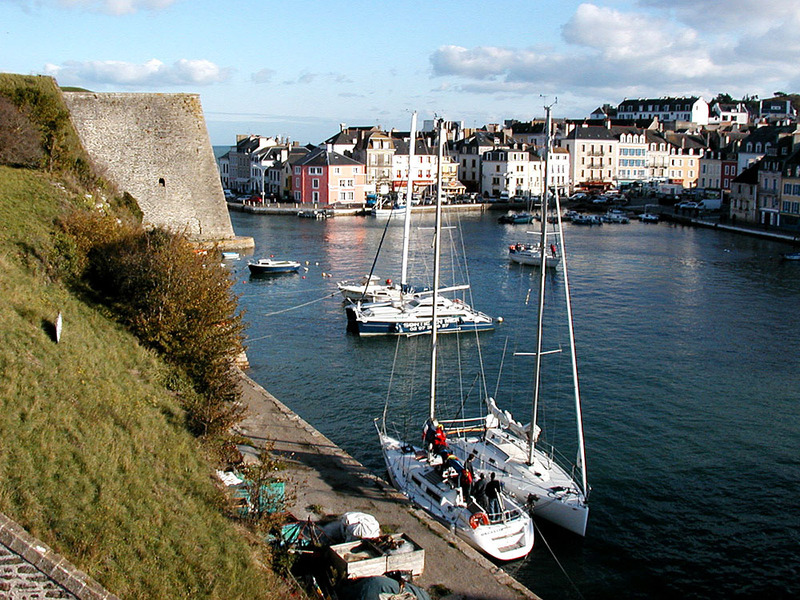 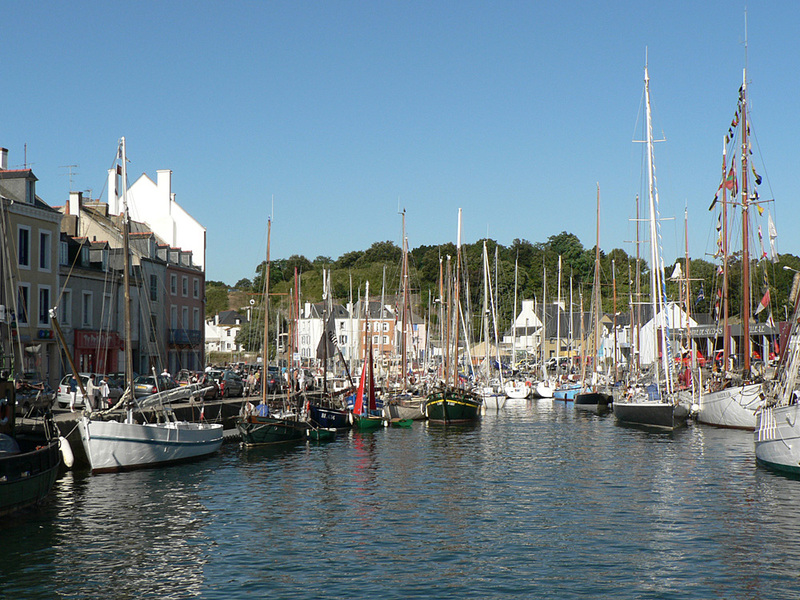 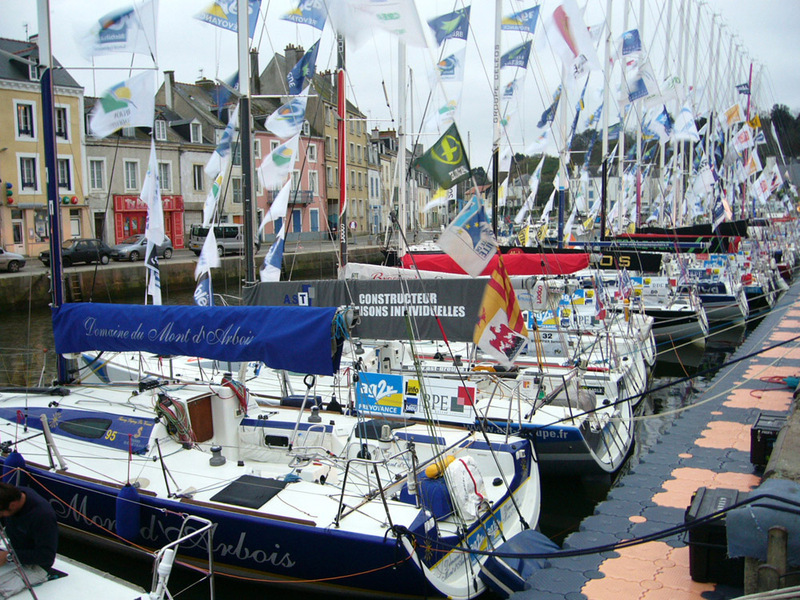 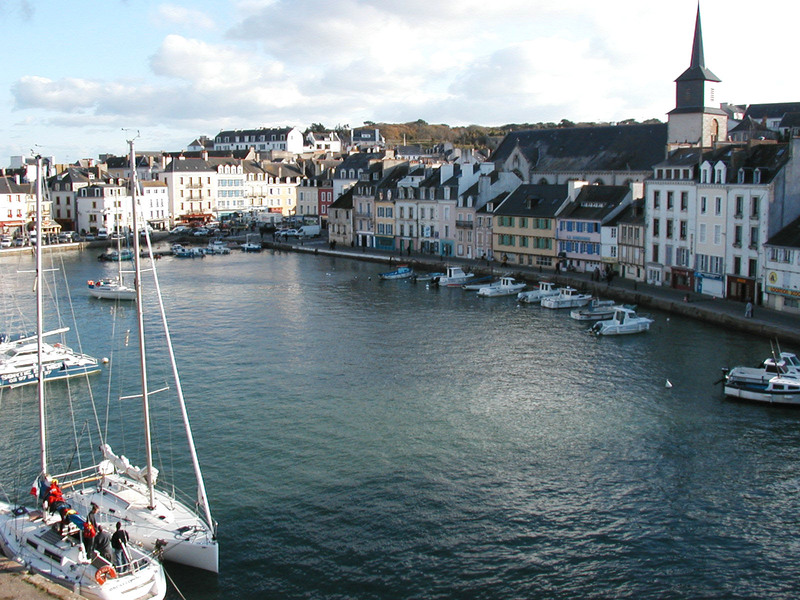 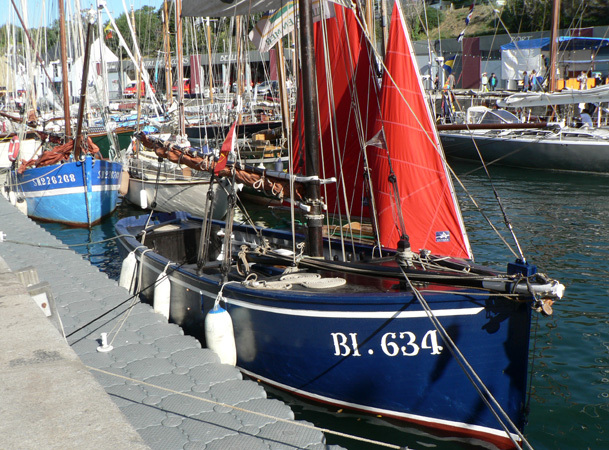 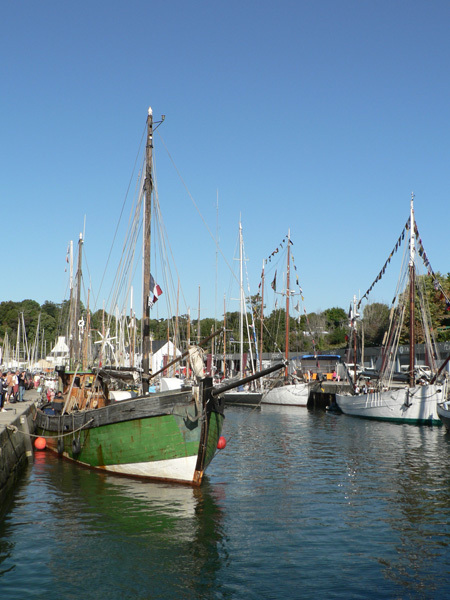 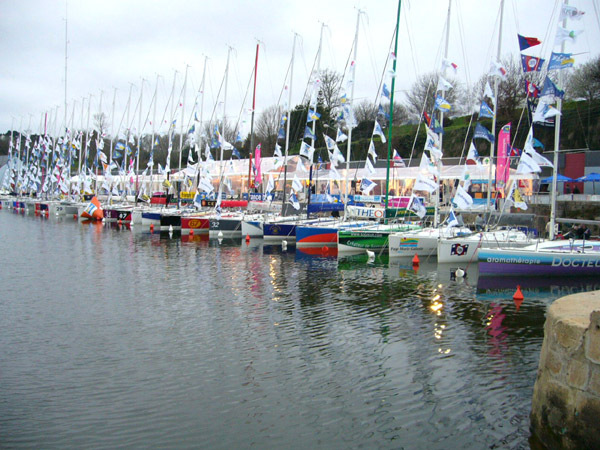 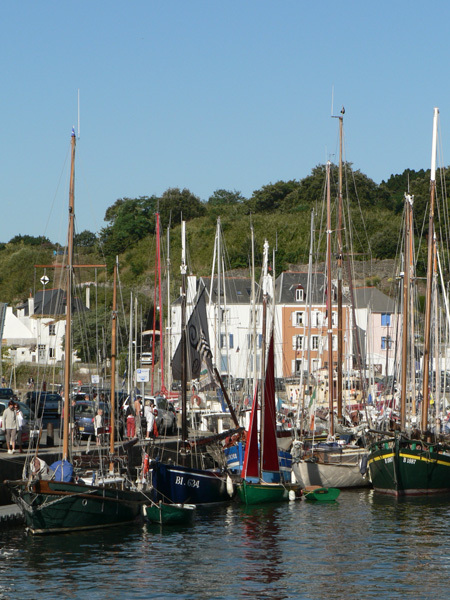 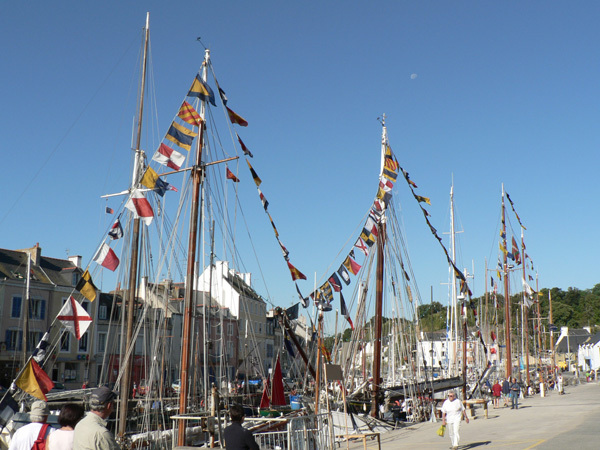 28 boats Bénéteau 2 (Figaro class) gather in the harbour of Palais. 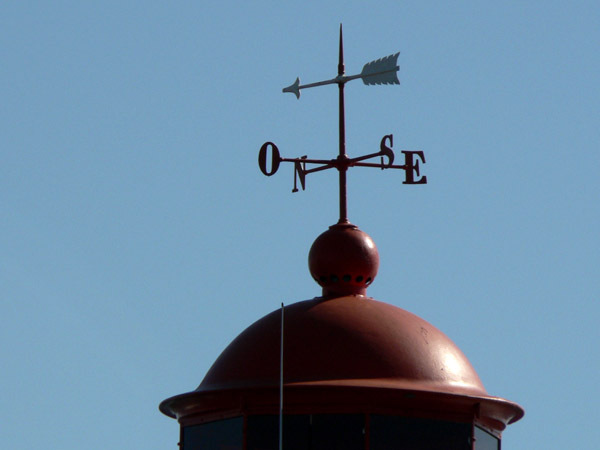 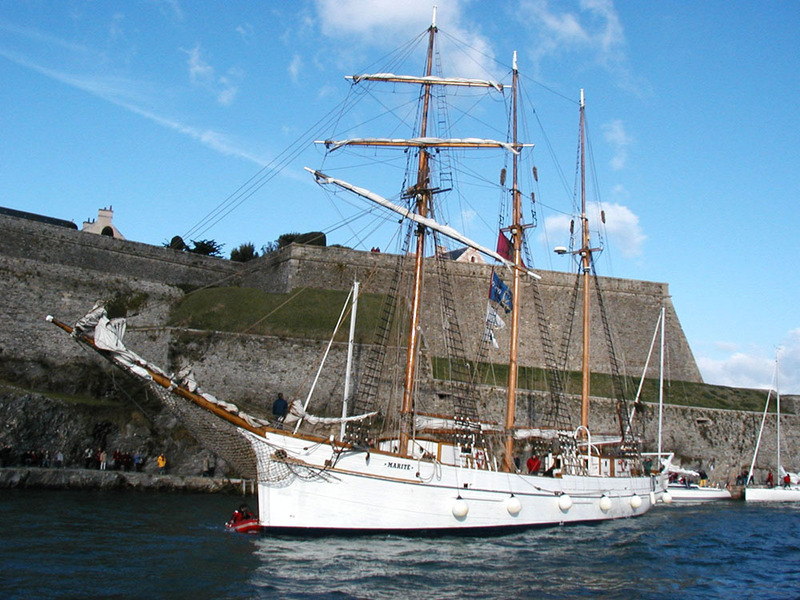 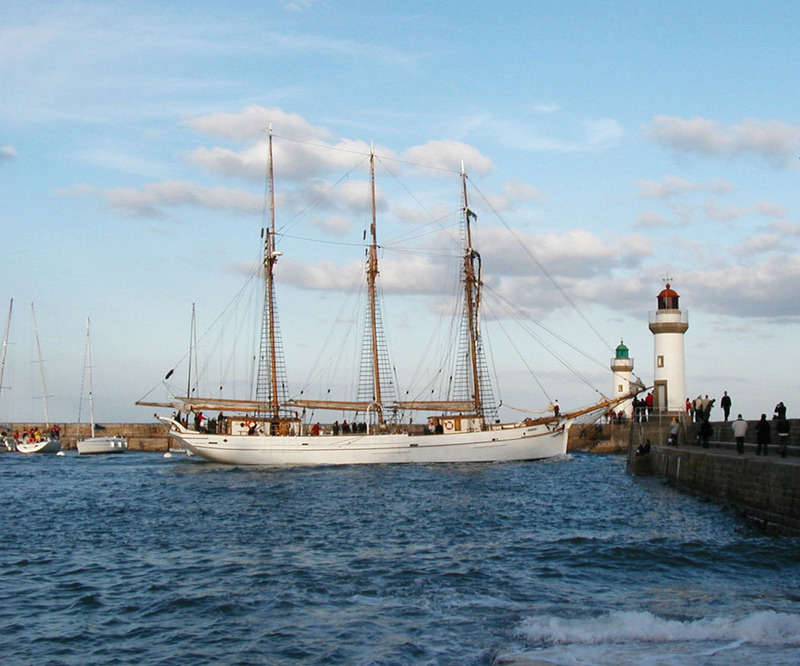 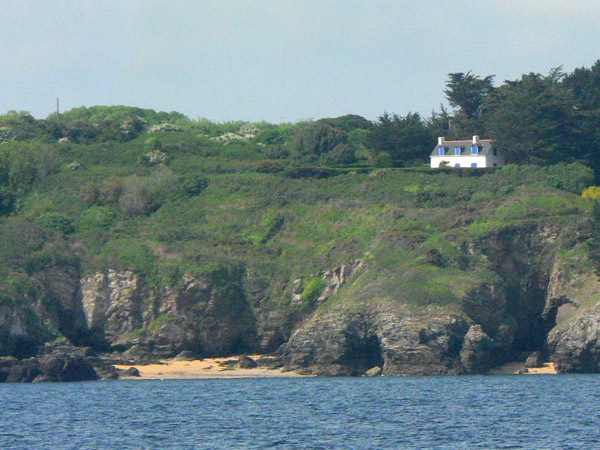 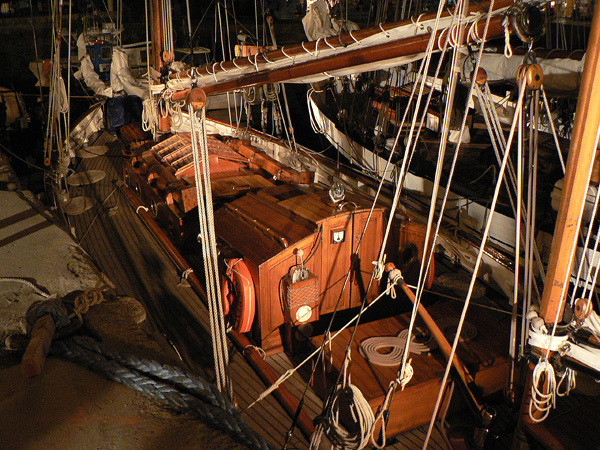 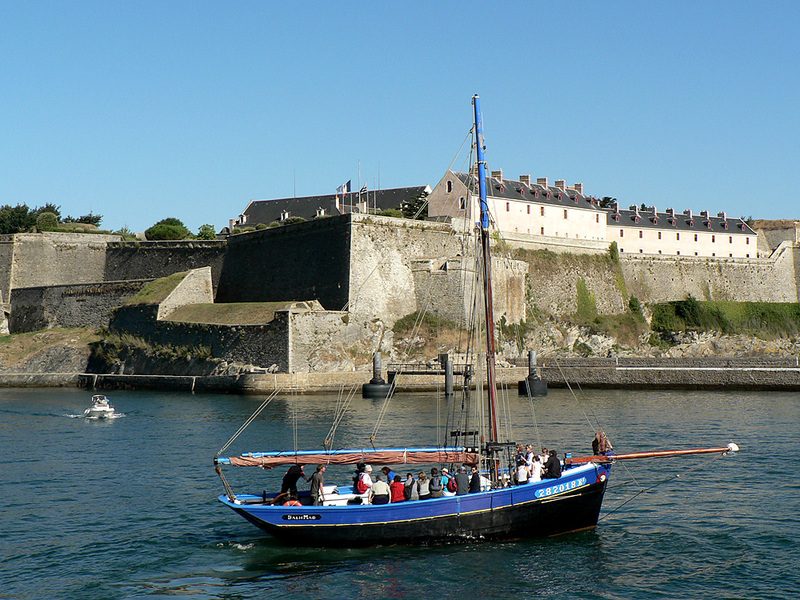 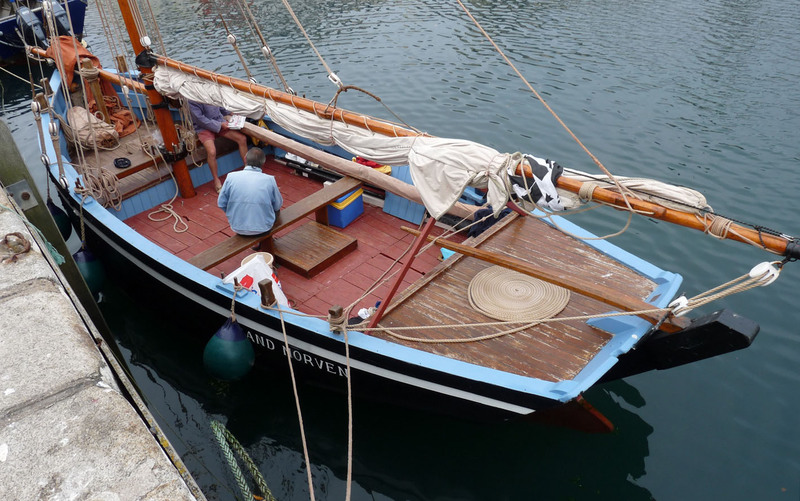 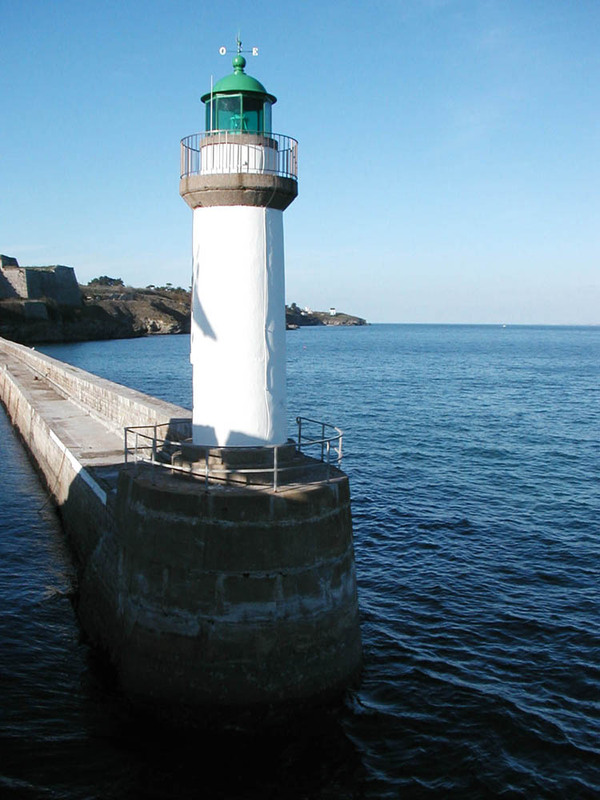 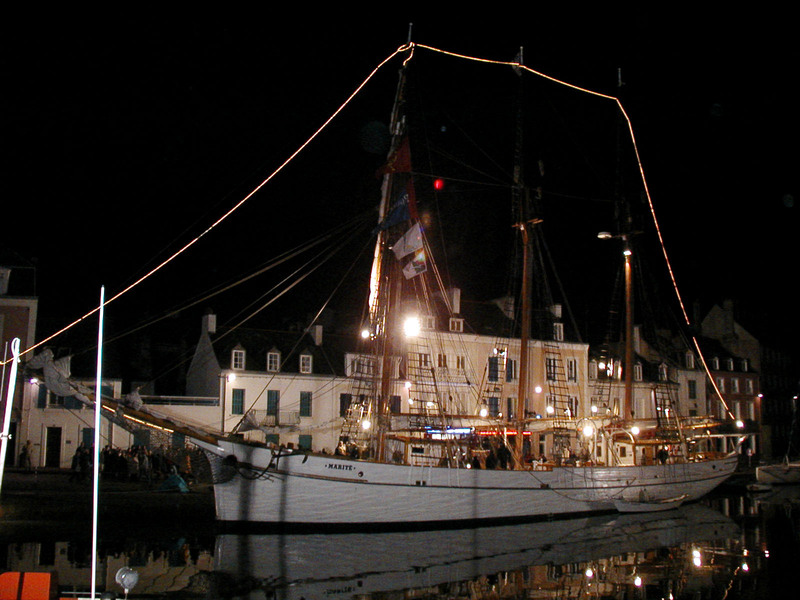 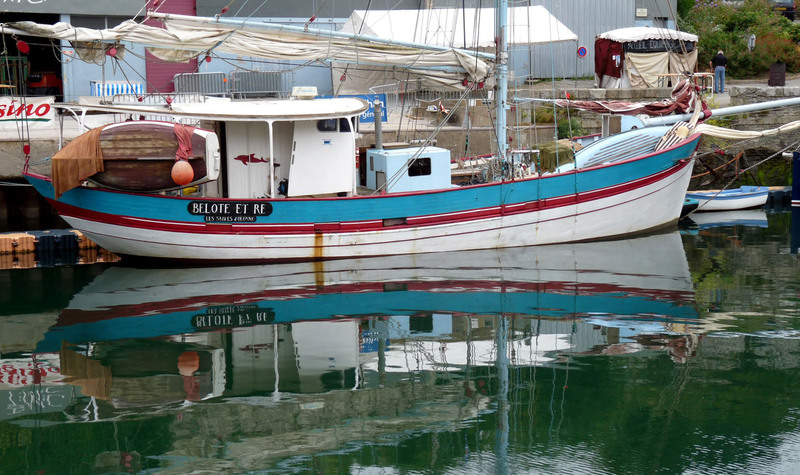 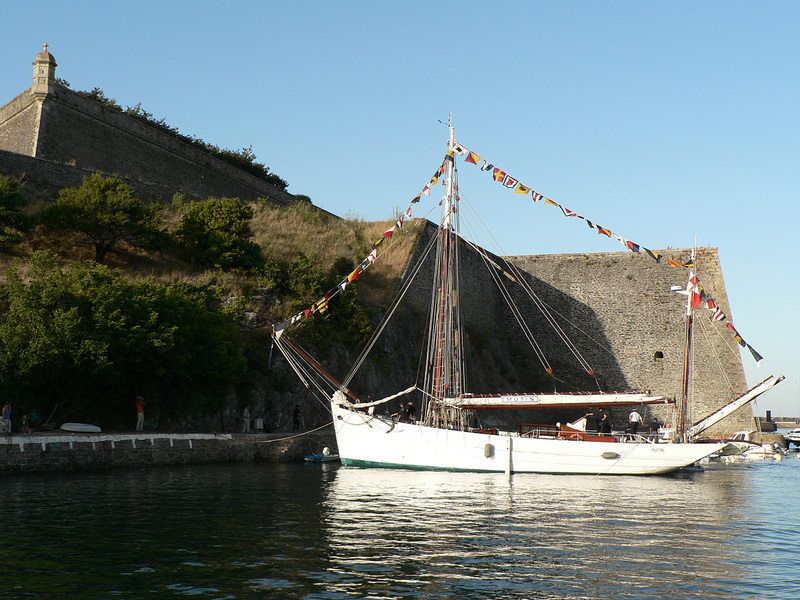 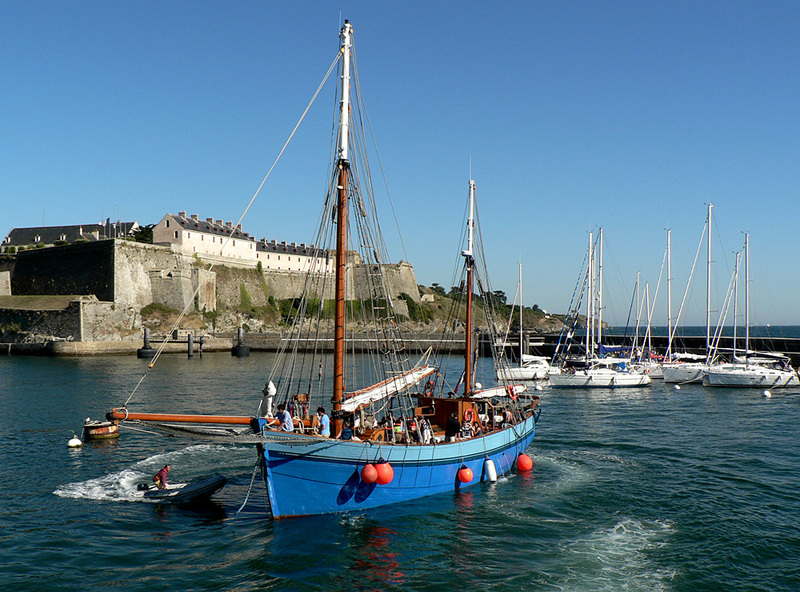 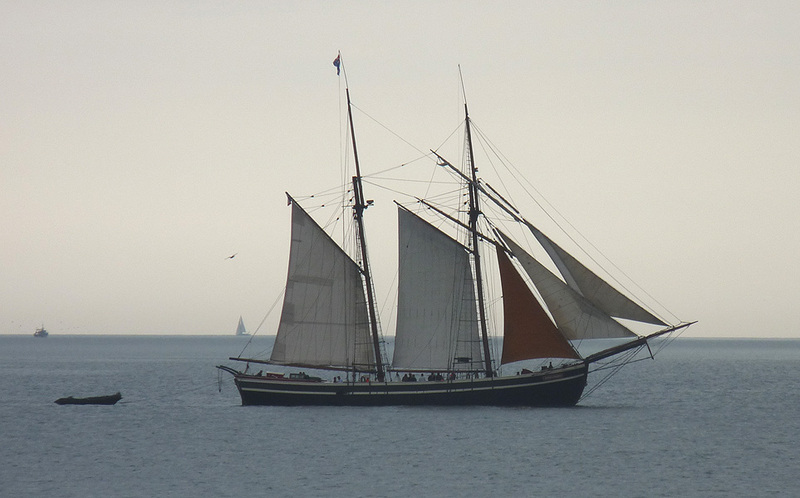 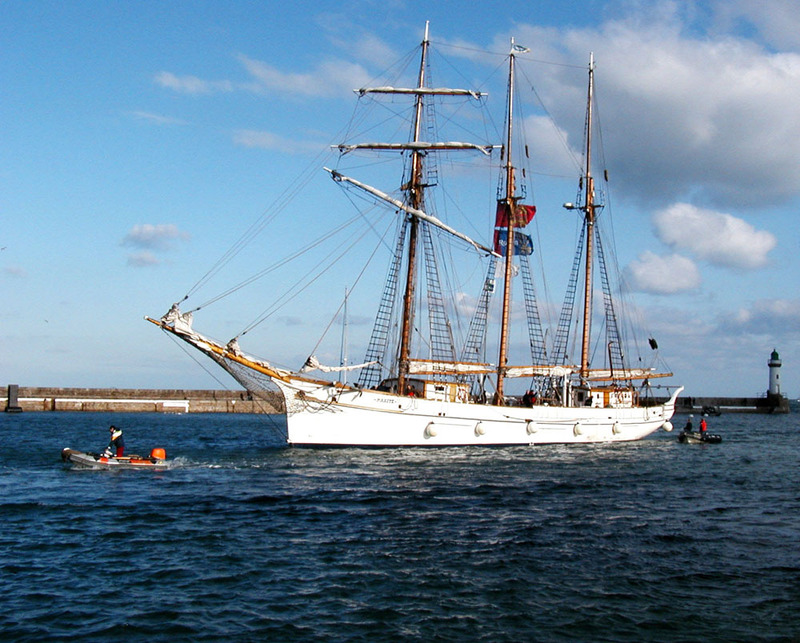 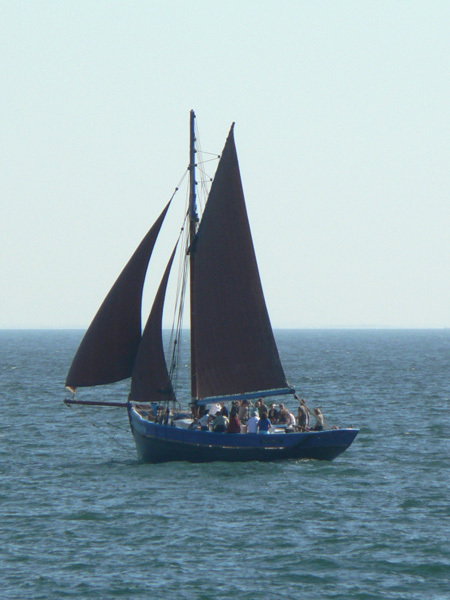 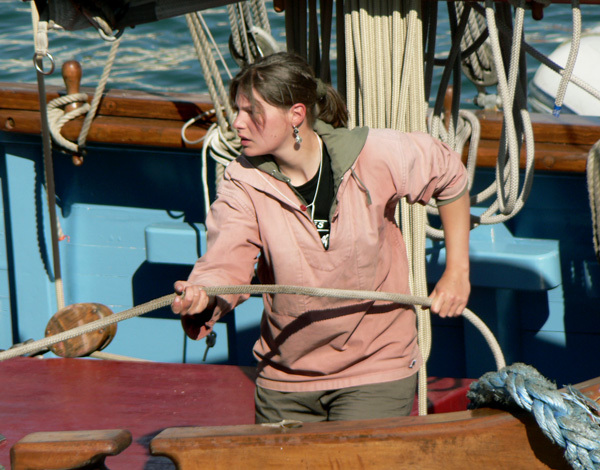 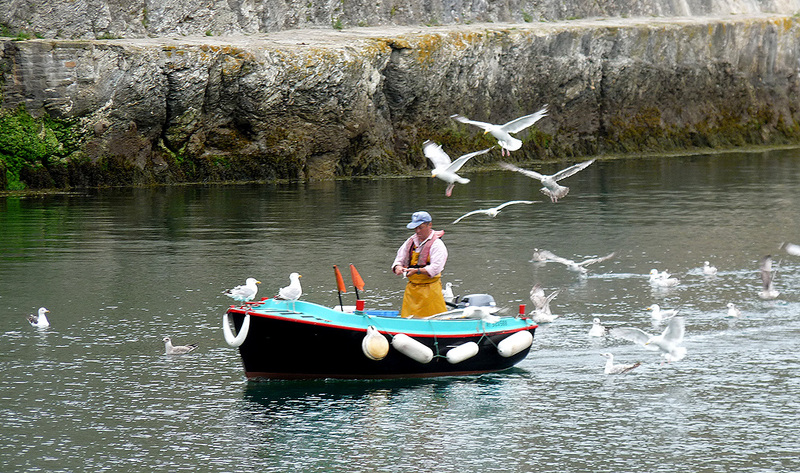 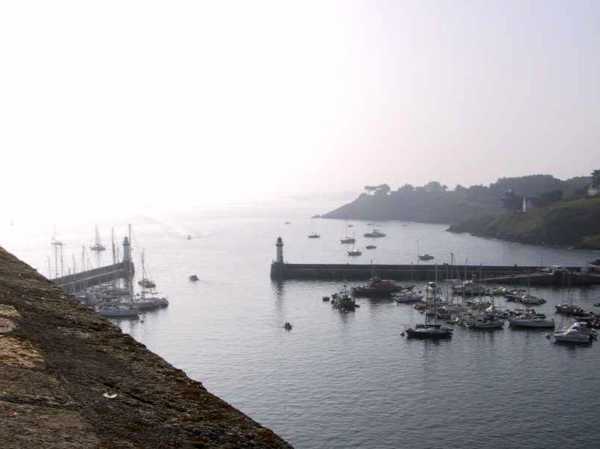 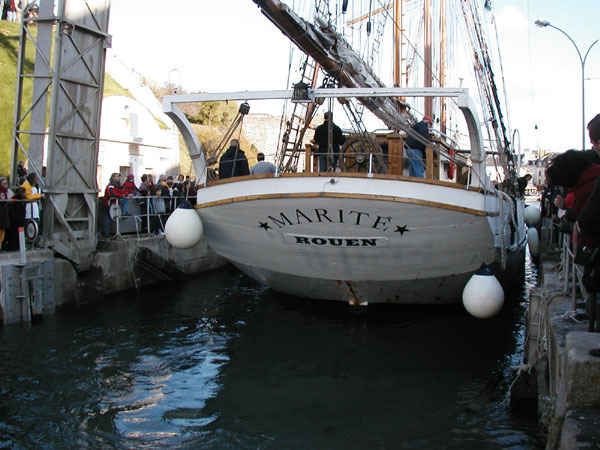 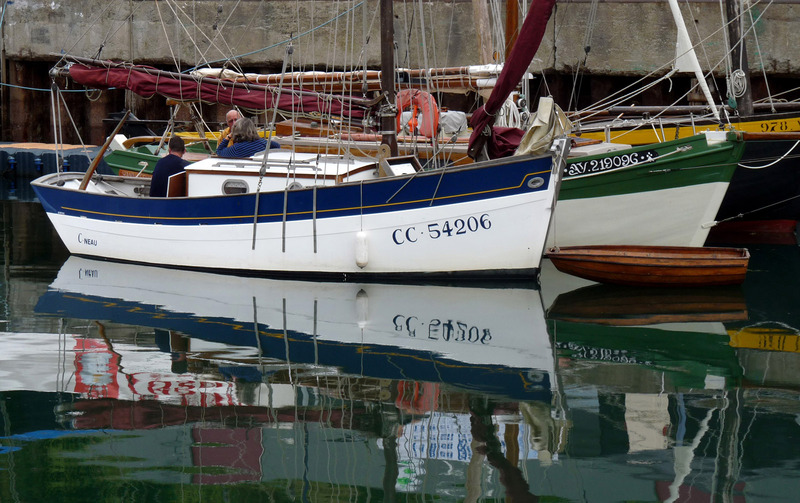 November 2004, the Thalassa team (French TV) comes to Belle-Ile with the Marité. 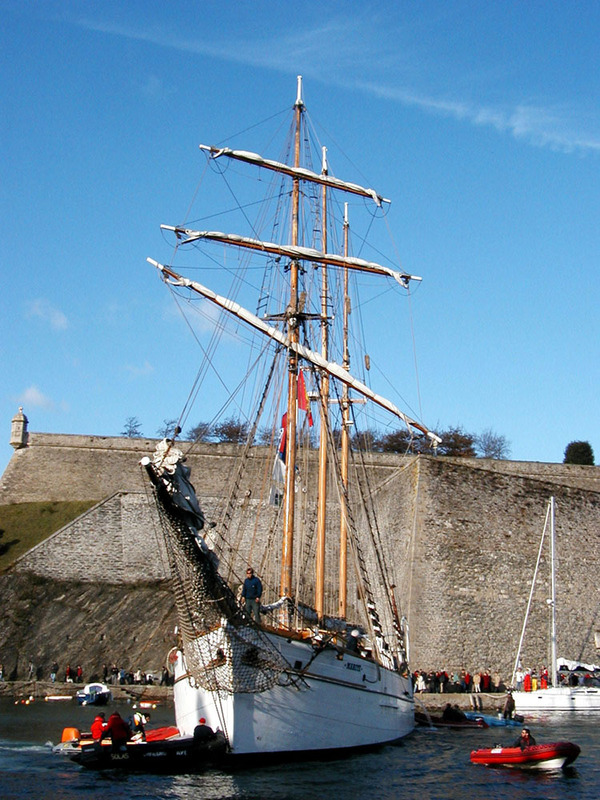 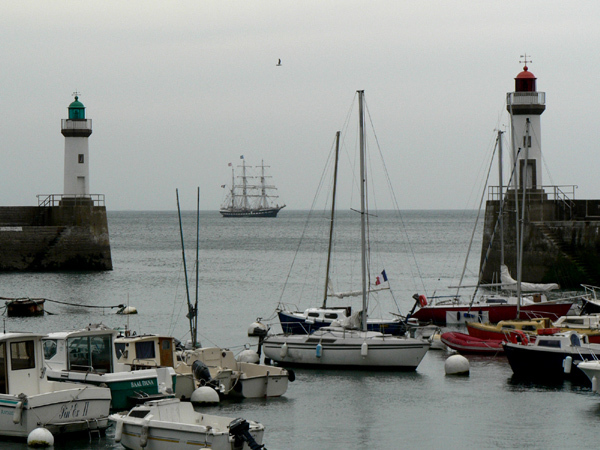 Here are some pictures of the visit of this three-masted ship to Palais. 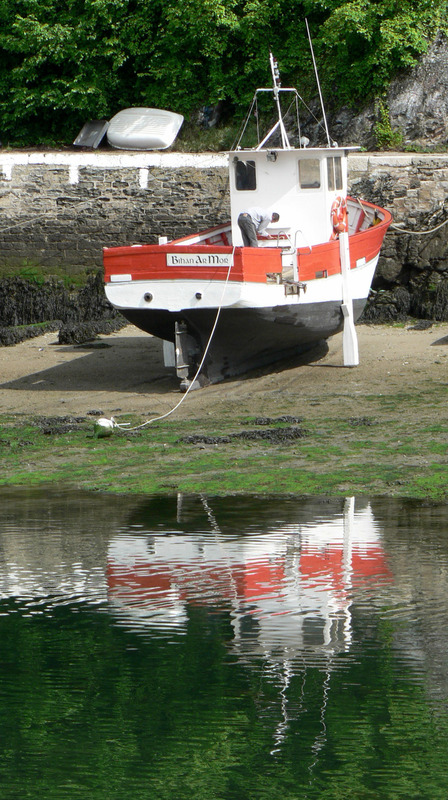 Palais beaching harbour, at high tide. 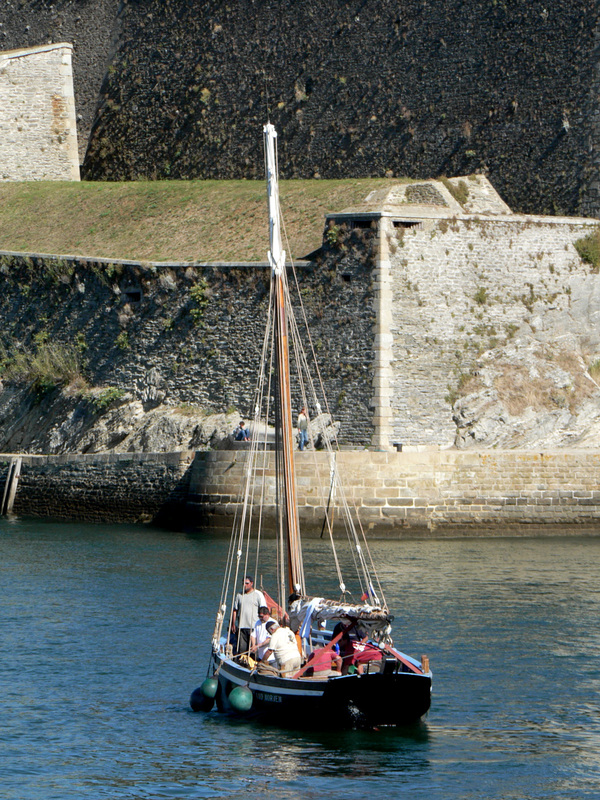 When passing the tide gate, the margin is very limited. 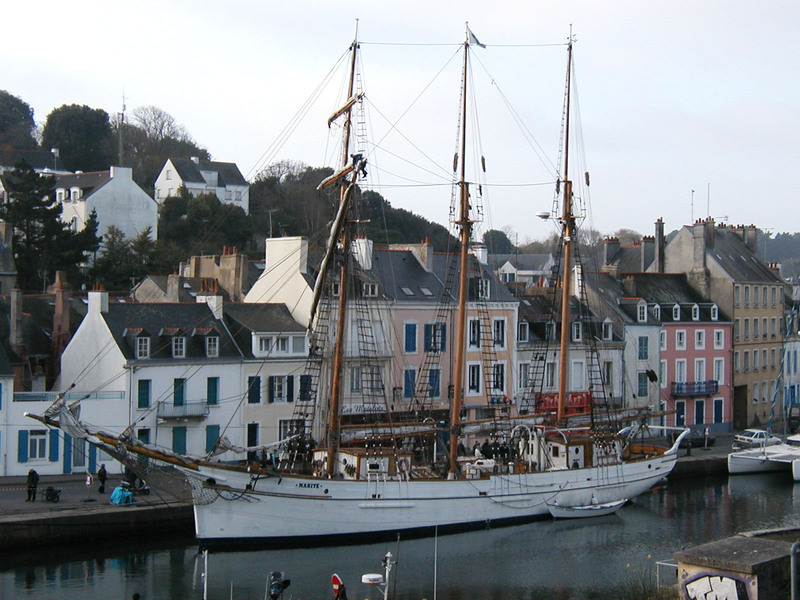 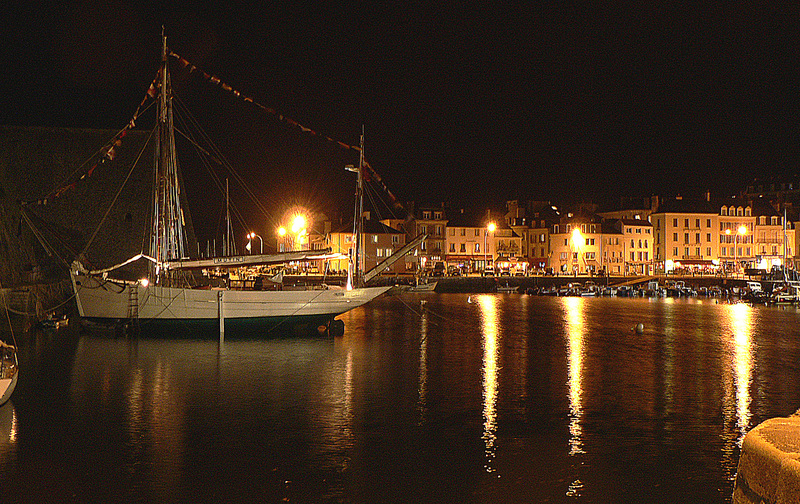 The Marité moored at the Gambetta quay. 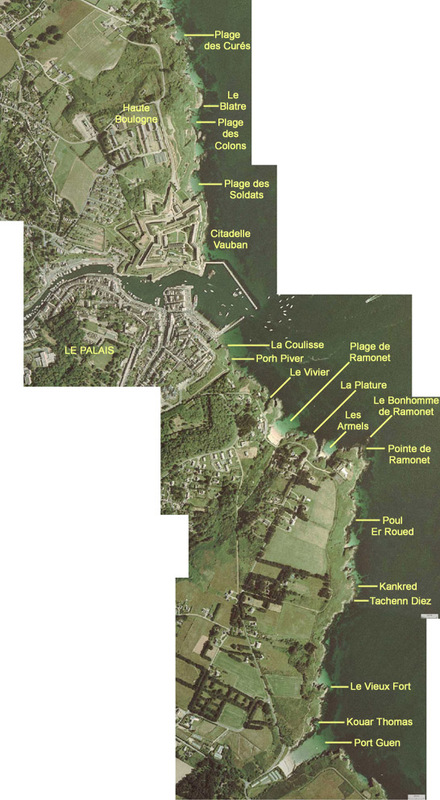 Two small beaches are located in the south of Palais: "Ramonet" and "les Armels", and some other beaches are located in the north of the citadel: beach of the "Soldats", of the "Colons" and of the "Curés" (there are two beaches of the "Curés": this one, on the north of Palais, and another one near the Port-Coton needles). 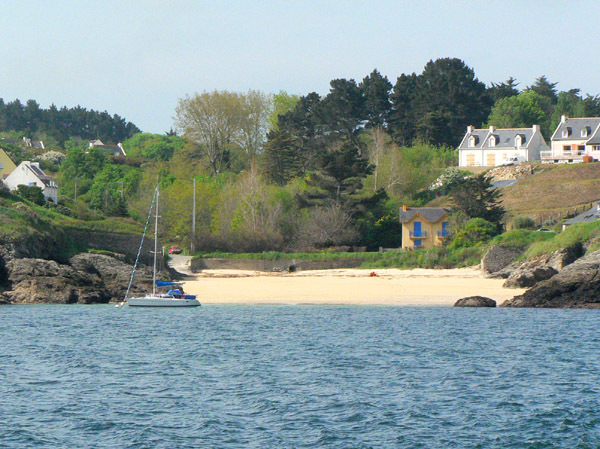 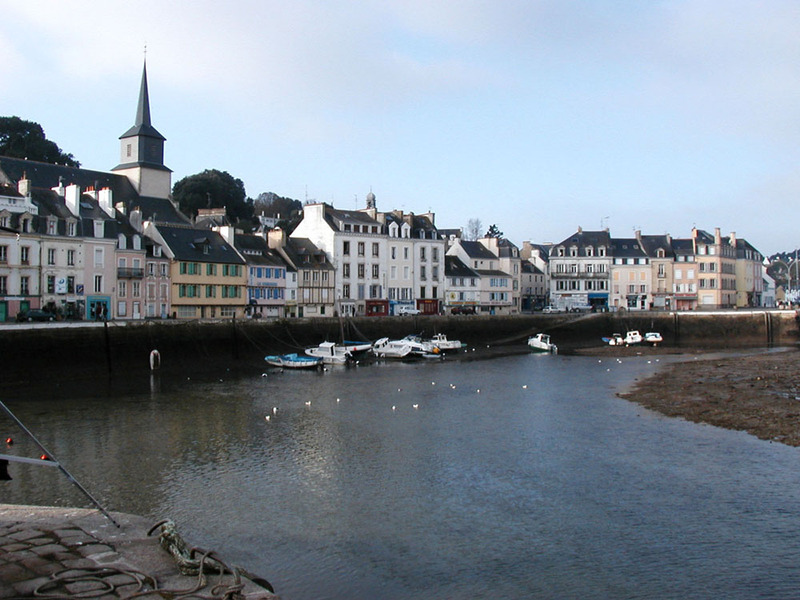 More in the south, along the road leading to Bordardoué and Samzun, you will find the beach of Port Guen in a small valley.